Features - What Is Kintsugi? Kintsugi, also known as kintsukuroi, is the Japanese art of repairing broken pottery with lacquer dusted or mixed with powdered gold, silver, or platinum. Directly translating to “golden joinery,” as a philosophy, it treats breakage and repair as part of the history of an object, rather than something to conceal. The thinking behind kintsugi is often likened to the Japanese philosophy of wabi-sabi, an embracing of the flawed or imperfect. Japanese aesthetics value marks of wear, which signify the use of an object. This can be seen as a rationale for keeping an item around even after it has broken and as a justification of kintsugi itself, treating the cracks and repairs as simply an event in the life of an object rather than allowing its service to end at the time of its breakage. The process also relates to the Japanese philosophy of mushin, translating to “no mind,” which encompasses the concepts of non-attachment, acceptance of change and fate as aspects of human life. The kintsugi technique may have been invented around the fifteenth century, when Ashikaga Yoshimasa, the eighth shogun of the Ashikaga shogunate, after breaking his favourite tea bowl, sent it to China to get it repaired. Unfortunately, at that time the objects were repaired with unsightly and impractical metal ligatures. It seemed that the cup was unrepairable but its owner decided to try to have Japanese craftsmen work on it. They were surprised at the shogun’s steadfastness, so they decided to transform the cup into an artwork by filling its cracks with lacquered resin and powdered gold. 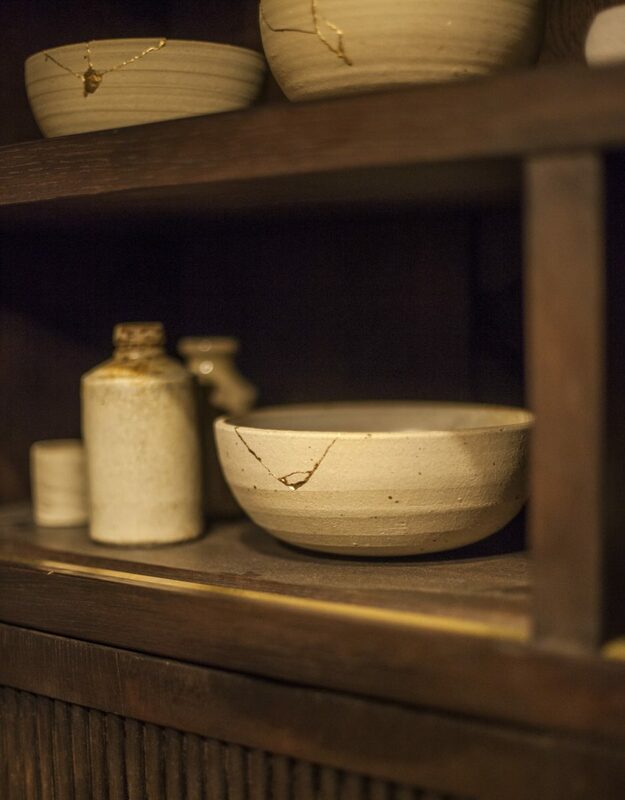 The legend seems conceivable, since the invention of kintsugi is set in a very fruitful era for art in Japan. Under Yoshimasa’s rule the city saw the development of the Higashiyama bunka cultural movement that was heavily influenced by Zen Buddhism and started the tea ceremony, ikebana traditions, and the Noh theatre. To learn more about kintsugi, running regular workshops in Oxfordshire, as well as on occasion in London during Craft Week, British-based ceramics artist Iku Nishikawa offers specialist repair services and classes in the art form, bookable online.